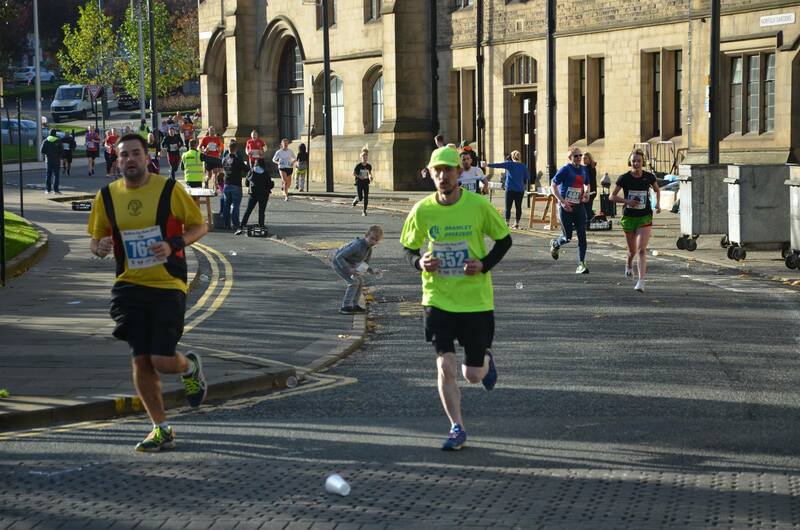 On Sunday, Bradford MDC hosted the sixth Bradford City Runs, a unique event which includes three races on one course. Here, one loop of 5k gives the runners the chance to view the city in all its glory as the course skirts the centre. But for those who couldn’t take it in first time around, then two laps, therefore 10k, might do for you. Here, Pumas’ very own Simon Wilkinson, Mark Brook and Bryonie King decided that this was the option that suited them. Tiffany Lewis, on the other hand, is someone who works in Bradford and therefore perhaps felt duty-bound to pay the city of her workplace full homage. She elected to run four laps (and a little bit more) to thus complete the half marathon event. Watching frustratingly from the side-lines was Wendy Hewitt. She’d registered to run the 10k but had to pull out due to illness. Mark Brook, Tiffany Lewis and Simon Wilkinson pose pre-race. One of these runners will run more than twice as far as each of the other two. Can you work out who? All three races started off simultaneously at 9.30am from Centenary Square, the route taking the runners up Thornton Road, left down Longside Lane, left into Shearbridge Road before picking up Great Horton Road and heading back towards the city centre, having circumnavigated the University of Bradford. Dropping down Morley Street, the route passes the Alhambra Theatre on the left and continues around the Magistrates Court along Princes Way, along Norfolk Gardens with City Hall on the left, then picking up Broadway, looping around the shopping centre and heading towards Little Germany and a slight climb via Well Street, Vicar Lane and Peckover Street. The route then heads back down towards the city centre, passing Bradford Cathedral on Church Bank, then continuing down Lower Kirkgate, into Hustlergate and Market Street and into Centenary Square to complete one circuit. Each route finishes with a three-quarter loop of City Park Mirror Pool and Fountain to finish beneath the Magistrates Court. 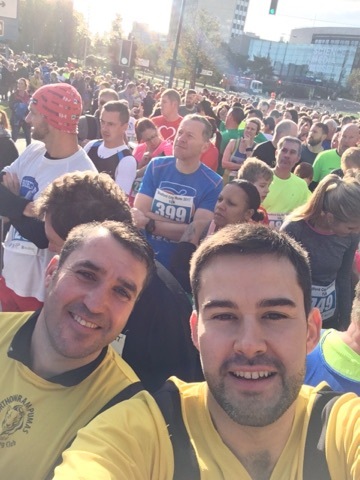 Mark and Simon capture the atmosphere on the start line with this all-important selfie. 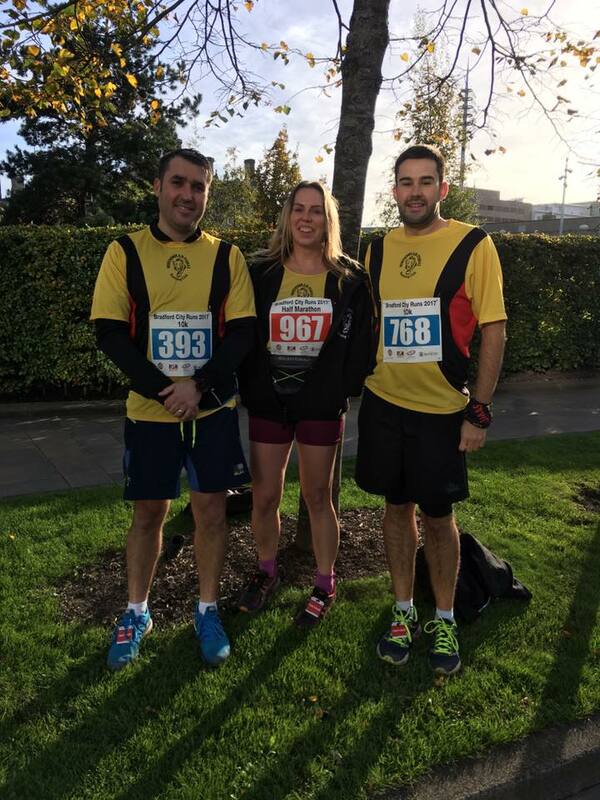 The 10k event attracted the most interest – 416 runners as opposed to 287 running the 5k race – with Simon Wilkinson determined to achieve one of his targets for the year, that of completing this distance in under fifty minutes. Incredibly, he ran the first half of the race in 23:56 to give him a great chance, and though he slowed somewhat over the second circuit, he managed to finish in a personal best of 49 minutes 13. He was, of course, #FPH. A fantastic achievement, and clearly the sky’s the limit for this Puma. If he carries on like this, he’ll probably go beyond that, too! Tiffany Lewis wades through the hoards of runners shortly into her race. At this point, there’s just about another thirteen miles to go. Several weeks ago, Mark Brook completed the Cannonball Brighouse 10k in 54:52 on a course that was as flat as anyone could have expected. So it was always interesting to see how he’d fare on this Bradford circuit where there were slight climbs, a pull up to Little Germany but nifty downhill sections. Mark’s been coming on leaps and bounds, so it surprised no one who’s been following his progress to see him complete this course in an even quicker time of 54:15. Obviously he’s getting fitter and faster, though just what was behind this time we’re not quite sure. It could be that he was still on a high after attending a Little Mix concert two nights earlier – or perhaps it’s the benefit of all that looping paying off. Asked how he felt after completing the two laps, Mark, a man of few words, replied, “Great.” He said the same when describing the Little Mix concert. Simon passes the watering station and is ready to start his second circuit. He’s just run an impressive sub 24-minute first lap and will smash that fifty-minute barrier. 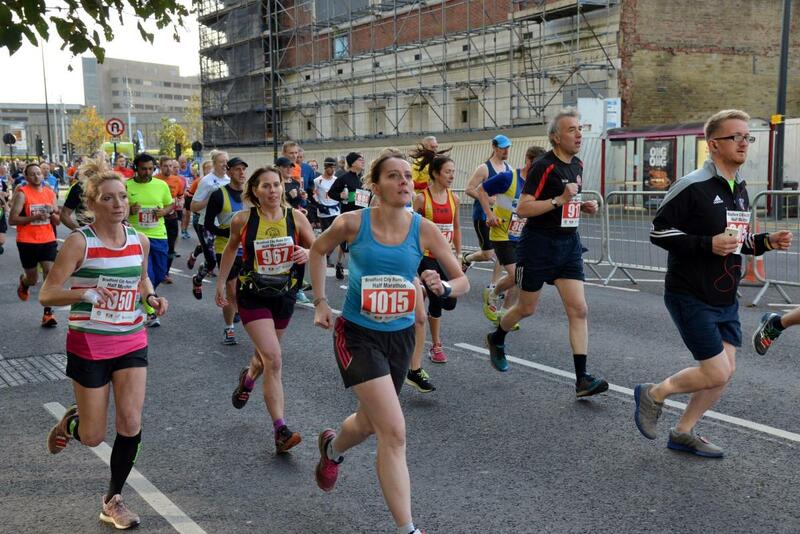 Bryonie King was not only representing the Pumas for the first time, or running her first 10k race. She was, so she tells me, running her first race EVER! Her time, therefore, of 1:01:59 is encouraging. Bryonie will have a good crack at lowering this next time out – which is this weekend when she, like scores of other Pumas, tackle the Abbey Dash. 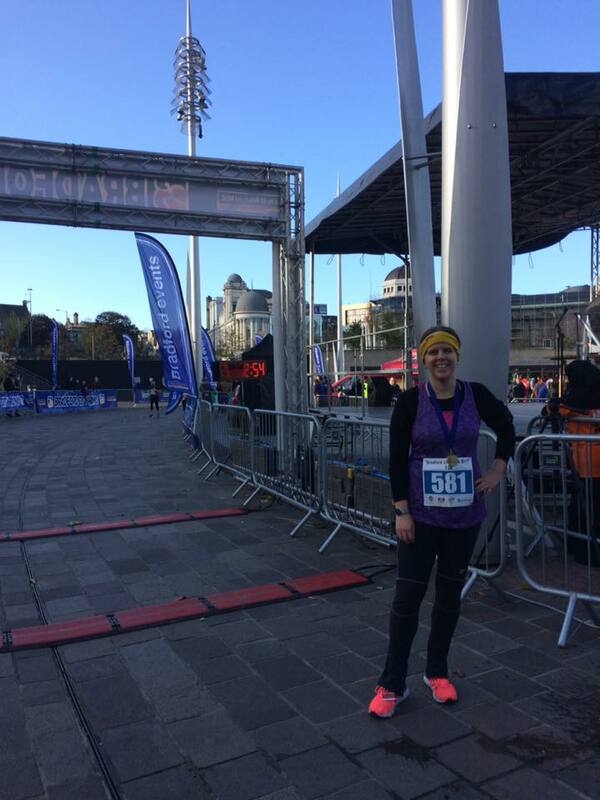 Bryonie King returns to the finish line to proudly show off her medal having completed her first ever race. There were 195 runners taking part in the Half Marathon, among them Tiffany Lewis, who’s willing to try any event over any type of terrain. Field and fountain, moor and mountain, she doesn’t care. 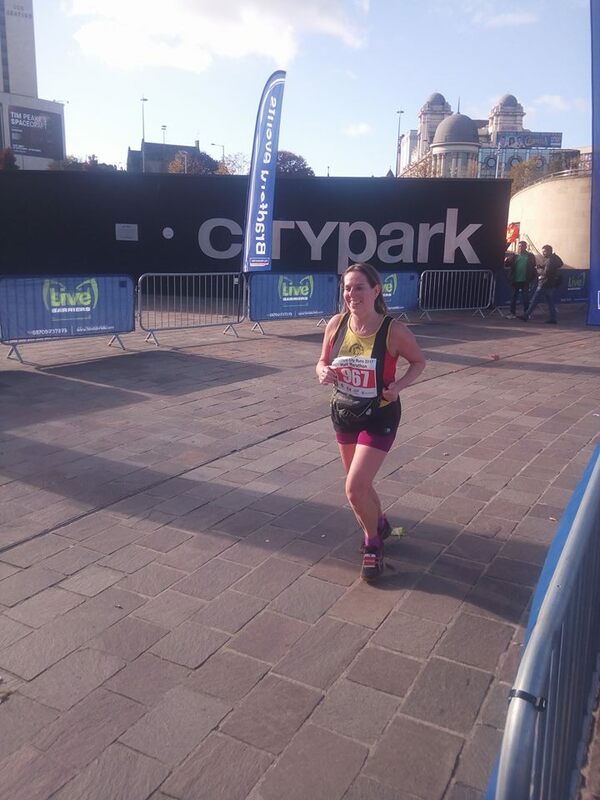 Always with a smile, she was well acquainted with the sights and sounds of Bradford as she trooped around, coming home in what was, for her, a personal best of 2:09:36. She finished 151st and was also seventh in her age category. She felt the course was “hillier than expected” but at least her Strava showed an impressive increase in her elevation gain (996 feet!) – because she had to do the same circuit four times! Tiffany heads towards the finish line, her smile telling you all you need to know; a half marathon personal best.